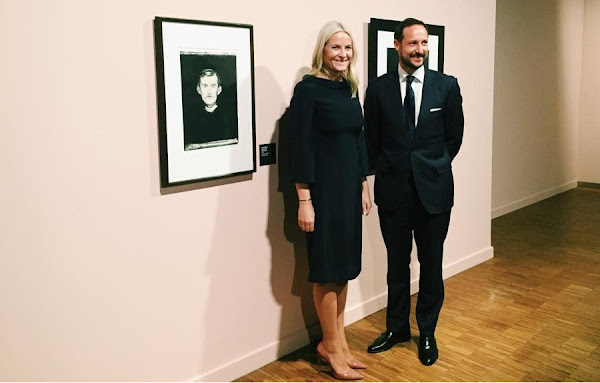 Yesterday, Crown Prince Haakon of Norway and Crown Princess Mette Marit of Norway attended opening of an exhibition at Munch Museum in Oslo, Norway. Sage ich nicht so oft über ihre Garderobe, aber hier sieht die ehemalige Frau Tjessem-Høiby richtig schick und elegant aus. Bitte in Zukunft mehr davon. I can only see crownprincess Mette-Marit. Where is her mother? Richtig lesen! Ich schrieb "die EHEMALIGE Frau Tjessem-Høiby..."!! The commemt referred to the FORMER Frau Tjessem-Høiby!!! German is a difficult language for some people. Sie ist nie "Frau Tjessem-Hoeiby" gewesen, aber Freulein Tjessem-Hoeiby doch. Sie ist nicht frueher geheiratet gewesen! She has never been married until now! Fräulein?? Sie war, bevor sie Haakon heiratet, Mitte zwanzig und bereits Mutter eines Kindes. Im Deutschen wird man dann nicht mehr als Fräulein bezeichnet sondern als Frau-verheiratet oder nicht. 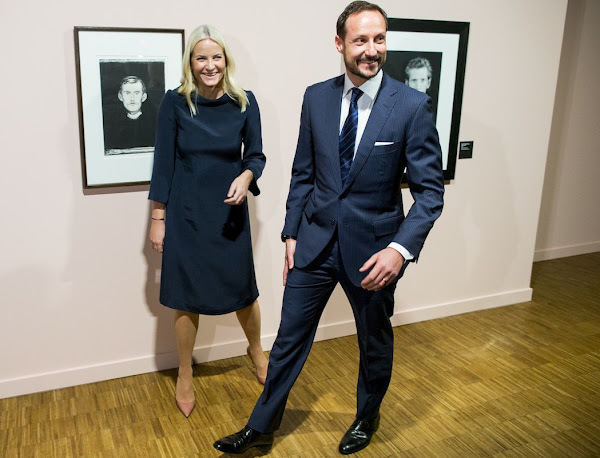 Mette-Marits Mutter heißt übrigens nur Tjessem- nicht Tjessem Høiby. Oder? Yes 12:55, MM mother just use Tjessem, not Tjessem-Høiby because she went back to her maiden name after the divorce from MM father. I don't know in Germany, but this is common to do in Norway. And in Norway everybody is Mrs too married or not, miss is no longer in use 12:43 says. Ach, und fällt euch was auf? Das Kleid, die Strumpfhose, endlich keine blickdichte mehr, und die Pumps, das schmeichelt ihr. Ich bin begeistert! I agree, the whole look is a huge improvement. Keep it up, Mette-Marit! endlich keine schwartze strumphose mehr!!!! What bahamas vacation? Have you been reading German fantasy press;) And they have a lot of dutys together. Because Mette is the only one Who can wear them even in summery time, whether the dress is light or not. Anyway, she is not a stylish lady, never has been. But she is beautiful and once in a while she can be elegant like with this outfit. So I agree, give her a break. She really needs to stop bleaching her hair, it needs care. Her choice not yours, does she tell you how to wear your hair? Please stop comments like this, as if we can decide how other people should look! Think we should rather stick to talk about things we like, and keep all the ugly, negative and demeaning comments to ourselves. We wouldn't like if We or our families were treated like that, would we? No, none of us would but I guess it happens to every royal especially here it seems to thrive on nasty, negative comments. This comment is not so bad many are much worse. The previous post was not mine. Does those nasty comments make you feel somehow better or what is aim to dig out something mean for every royal lady here? I really cannot understand this kind of negativity here exists. Too thick pantyhose? Don´t you know we have here in north now winter, of course she is not with 10 deniers this time of year. Also she does not have very dark own hair color, in my eyes her hair looks quite good. Although I'm not agree with you as for most of yr comments., here I am completely with you!